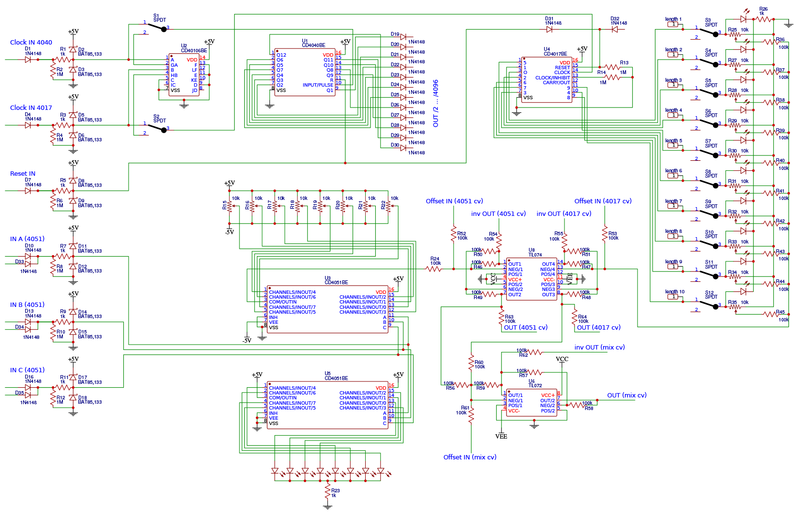 MUFF WIGGLER :: View topic - are there unnecessary parts in my schematic? 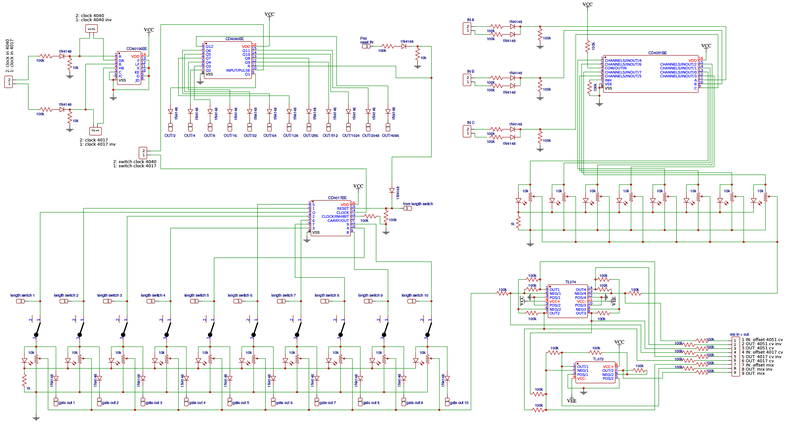 are there unnecessary parts in my schematic? 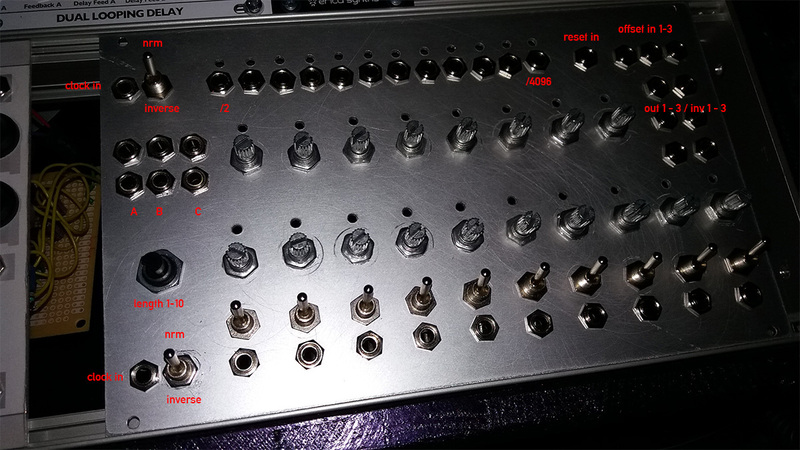 but i never came across so many diodes in any of the kits i built, so thats why i am concerned..
the 4040 divider outs are to go to the a,b,c inputs of the 4051, but they should be able to trigger other stuff in my rack as well. plus, all circuits should be able to be alive after some wrong patching. a,b,c should work with triggers from other modules as well. maybe someone can give advise. 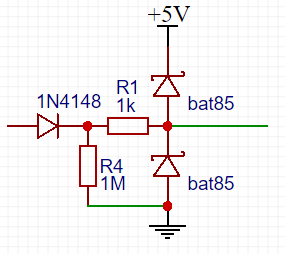 Input protection: you don't need both a 1N4148 in series with the input and a BAT85 to ground after the 100kohm resistor as they do the same thing; preventing the cmos input from going below Vss. In fact, the 1N4148 diode will prevent the circuit from function correctly. The cmos input can be forced high through the diode but it can't be pulled low again as the diode prevents the current from flowing back again. The input voltage will be determined only by leakage currents in the internal input protection circuit, the external BAT85 diodes and the 1N4148 diode, neither of which you have any control over. So if you want to keep the 1N4148, a resistor in the 100kohm to 1Mohm range can be placed after the diode to ground. 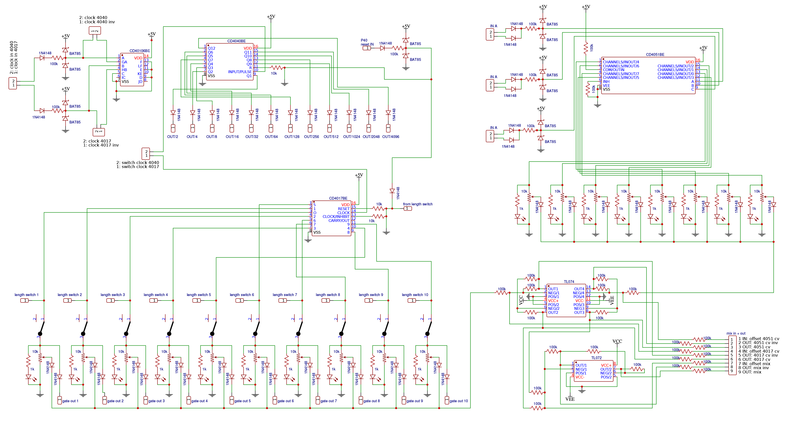 This will also be needed for any logic cmos input that can be left unconnected, for instance if a clock input is disconnected from a clock source. Or a reset input. I'm not sure about the purpose of the two diodes controlling each of select input of the CD4051 circuit, but the same concerns are valid here. A CD4051 has an switch resistance of about 200ohm at 5V. If a final decision has been made to limit the supply voltage to 5V I would suggest that the IC is replaced by a 74HC4051 as it's switch resistance is only 90ohm. But an even better alternative is a 74HC238 which is a digital 3-to-8 demultiplexer with only 45ohm output resistance. That resistance is important as it has to drive several mA to the LED so there will be a voltage drop that will affect the voltage to the potentiometer and it will vary with temperature. If you stick with a 4051 type mux, the 100kohm resistor connected to the common terminal must be removed as it will be in series with the switch resistance and will not be able to drive neither the LED nor the potentiometer. Since only one of the outputs are high at any given moment, you can save 7 current limiting resistors for the LEDs by connecting the anodes directly to the outputs and connect all cathodes together and then connect them to ground through a single 1kohm resistor. It would also be possible to replace the diodes connected to the potentiometer wipers with resistors to avoid the temperature dependent voltage drop across the diodes to minimize the voltage drift of the final output voltage. The 100kohm resistor after the diodes would then not be needed. The inverting input of the amplifier is a virtual ground so the different potentiometers would still be isolated from, and not affected by, each other. There are also two ground symbols connected to the reset inputs that should be removed. thank you very much. about the 5v / 12v i am still not sure. maybe it would be better to use 12 volts for a wider output range? and would that help reducing the parts? because the whole bat diodes could be removed as there could not be any higher voltage than the allowed 12v inside the rack? the diodes at the a,b and c input where ment so one can connect multiple trigger signals from for example the 4040, to create new patterns. how would i do this? i thought that or wired sockets would be a good idea. what input circuit would work there? if i went 12 volts, i could just use the two 1n4148 there to prevent backflow?? from my cmos tutorial i read that the reset needs to be grounded so the counting works. i guess the resistor just needs to be placed to ground, not the way i currently placed it. here is an updated circuit. would that still provide enough protection for the inputs if i run everything at 12v? 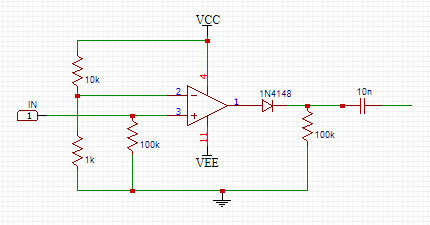 is it ok to use those 10k resistors after the diode to create a logic low if nothing is connected or recieved? oh and by the way, would this work to create a sequence of positive and negative signals? Except for the 1N4148 diode and the pull-down resistor, I would use the same input protection myself as you did in your first schematic so you had it almost right from the start. Sorry if I confused you. But remember the pull-down resistor must be placed before the 100kohm series resistor to prevent the signal amplitude from being reduced unless you use at least 1Mohm pull-down resistors. The same applies for the OR function for the select inputs for the 4051. First a diode, then a pull-down resistor and then the 100kohm resistor. The reset input has the same issue if even if you move the first pull-down resistor to before the 100kohm resistor since you have a second pull-down resistor near the 4017 counter. I think this resistor must be increased to at least 1Mohm. I also think you must add a diode between the length switch and the reset input of the 4017 or the lower output resistance of the 4017 outputs will override any external reset signal via the 100kohm resistor. I didn't mean to just remove the diodes in series with the potentiometer wipers but replace them with 100kohm resistors and connect the other end of each resistor directly to the inverting input of the amplifier. Otherwise you can even short the supplies if one potentiometers is set to max and another to min value. You can use a 4051 the other way around and select one of eight potentiometers but remember a 4051 can only handle 18-20V so it can't be driven by +/-12V directly. But you can use a DG408 that is also an 8-to-1 multiplexer but it can handle +/-22V supplies. Either way, you would then need a separate driver for the LEDs. There is no reason to supply all the logic with 12V just to get a larger output voltage range. This can as easily be done by increasing the gain in the amplifiers instead. There are two other reasons to drive the logic with 5V. The first is that you would otherwise not be able to drive the inputs directly with 5V control signals and would need level shifters like the transistor stages you have seen before. With a 5V supply from an internal voltage regulator you will have better control over the stability of that voltage and therefore any control voltage you generate from the 5V supply instead of being at the mercy of the global 12V supply and how it varies with load from other modules. this sounds reasonable to go for the 5v supply. however, if i want to use the pots between -5 and +5 volts, do i need to supply the 4051 with +12 volt, or do i need to supply it with -5v at vee and +5v at vdd? and will it still recognize the +5v gates at a,b and c? and i guess, due to missing english skills i still don't understand it completely for the input circuits. so i could remove the 1n4148 and add a 1M pulldown resistor to prevent an unconnected cmos input? edit: i have redrawn the schematic considering how i understood your information. does that look like it would work? 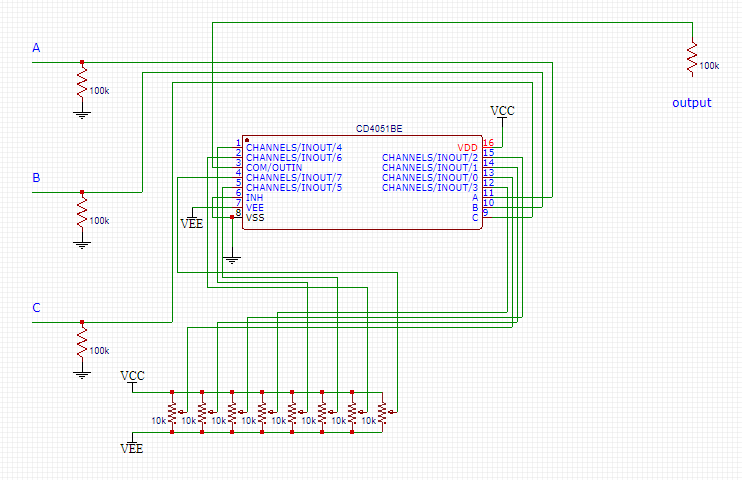 The 4051 needs supply voltages larger or equal to the input signal range so feeding it with +5V and -5V is fine. The 4051 needs control signals between Vss and Vdd and has internal level shifters generating signals between Vee and Vdd to drive the switches. Below are (some of) the options for input stages, to the left for inputs without OR function and to the right with. My preference are the two alternatives on the top as they don't attenuate the input signal no matter what pull-down resistor is used. I choose 100kohm pull-down resistors since this seems to be the "standard" for input resistance in modular synthesizers but isn't critical. The lower limit is usually set by the output resistance of the driving signal and the voltage drop that can be tolerated due to the voltage divider formed by the output resistance and input resistance. I have noticed that some unused inputs are connected directly to the supplies while others use a resistor. I have never seen a convincing argument why a resistor is needed but at least maybe you should be consistent. The 100kohm output resistors in series with the opamp outputs to the jacks are too high to work. Even with a single 100kohm input resistance half the signal amplitude would be lost. Again, the "standard" is 1kohm for outputs and will normally protect the outputs if shorted to other outputs or any supply voltage but will not have a significant effect on signal amplitudes but is still questionable for precise CV voltages. The outputs from the 4040 uses diodes in series with the outputs. I assume this is for protection but it will only protect the outputs if an external voltage higher than the output voltage is forced onto the output but will not help if the external signal is lower. Again, I would suggest replacing them with 1kohm resistors. One more thing. In another thread, Graham Hinton mentioned that some equipment using 4051 had failures because circuits from some manufacturers turns on a new channel before they turn off the old one resulting in a short between two inputs for a short time. This is true for chips made by RCA and NXP but it should be safe to use 4051 from Texas Instruments as they don't behave this way. in a previous build i recognized that my 4040 got broken by a false patch. that is, why i thought the diodes would be a proper protection. doesn't a resistor simply lets pass a 8v signal and that would destroy the chip? do i maybe need to add a resistor concerning negative voltage by wrong patching? good point with the resistors for the opamp outputs. as for the inputs where i have resistors to ground. i thought that would be the way to do it, to be able to switch between low and high without shorting. at least that worked in my test. the 4040 circuit worked in first tests with square lfo from mother32. If you go outside the supply voltages, current will always flow into the 4040 but the purpose of the resistor is to limit that current to a safe level. The 4040 output stages have internal protection diodes to Vdd and Vss so if you apply several volts outside the supplies to the output, massive amounts of current can flow in these diodes and overheat the circuit unless you have a series resistor limiting the current. For inputs, this current should in most cases be limited to 10mA according to the specification. For an output, the driver is normally physically larger than an input stage and should be able to handle more current so 1kohm should be fine. thank you. really helped me a lot.